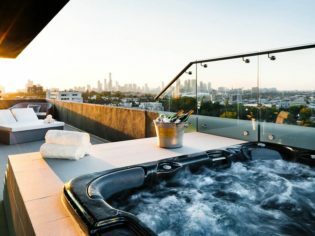 Fancy a stunning view across Melbourne’s city skyline from the comfort of your own spa? Try Olsen Penthouse then; Justin Bieber did. Sleek. Contemporary. Stylish. This is the epitome of the Olsen Penthouse, positioned on the 14th floor of The Olsen: a collection of five-star suites located on Melbourne’s iconic Chapel Street in South Yarra. This Art Series Hotel takes inspiration from its namesake and renowned Australian artist, John Olsen. The property was designed with Olsen’s conceptual style in mind: from the architecture to the décor. His artworks and sculptures are displayed throughout the hotel – even screen printed on some doors and windows. The facilities are truly top-notch: two delish eateries (New York-style steakhouse and Spoonbill Restaurant and Bar), a superb day spa, state-of-the-art gym, and extensive concierge services catering to your every whim – with even an in-house art curator. That’s pretty remarkable, but we can’t go past the uber cool glass-bottomed pool which gives guests a glimpse of bustling Chapel Street below. The wow-factor is enhanced in the Olsen Penthouse. With the deluxe bedding – exclusively from the Art Series – spacious walk-in robes, a gas fireplace, full gourmet kitchen and a dining table for ten, it would be hard to leave. Bieber chose to stay here when he was in town. And if it’s good enough for The Biebs… well, we suppose it’s good enough for us.